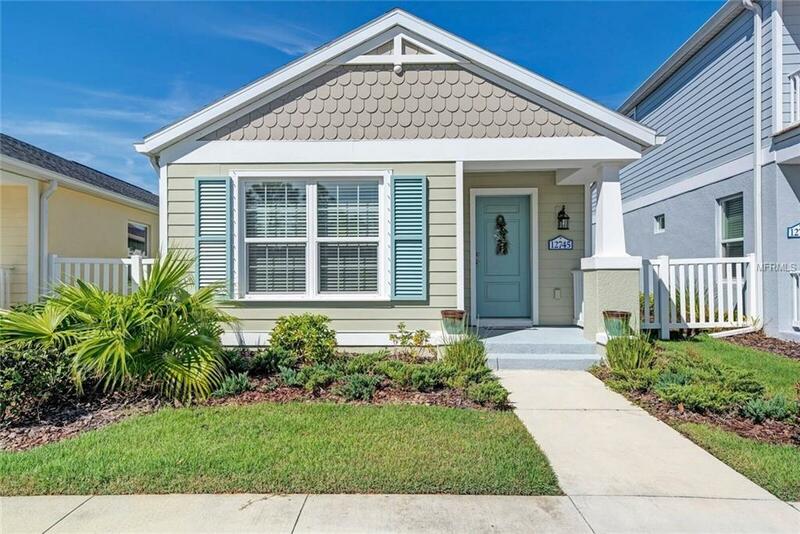 Maintenance free COTTAGE available in the Highly Desirable and Popular Grand Palm community! This adorable ROSE Cottage home has MANY upgrades! The kitchen has granite counter tops, custom backsplash, light upgraded cabinets with undermount lighting, soft close cabinets, pull out drawers, extra deep drawers for all of those pots and pans and "print-free" upgraded slate appliances. The master bathroom has beautiful abalone shell inlay and an upgraded vanity with a large walk in shower and no tub. The garage was recently insulated. There is some space between the bedrooms and laundry room that could make a good office space or mud room. This home was just built last year and is like brand new inside. Ceramic tile throughout and carpet in the bedrooms. High volume ceilings make this home seem larger then it really is. Grand Palm is not making this model any longer~ Grand Palm is an amenity-rich and active community complete with clubhouse with full gym, lifestyle director, resort and lap style pools, tennis courts, volleyball, basketball, Bocce Ball, 2 dog parks, and over 28 miles of paved walkways and so much more!